Masala chai is a beverage from the Indian subcontinent made by brewing tea with a mixture of aromatic Indian spices and herbs. Ingredients: Tea Blend *, Cinnamon *, Ginger *, Clove *, Cardamon *, Black Pepper *, Fragrant Rose *, Star Anis *, Galanga Root *, Nutmed *. 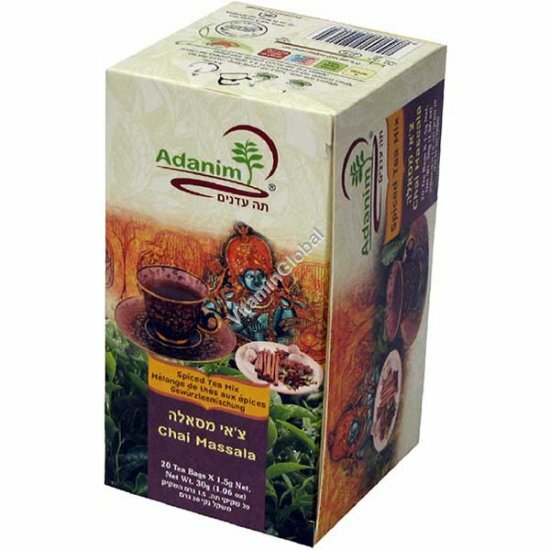 Brewing instructions: Place one tea bag of Adanim organic Masala tea in a cup and add boiling water. Let steep for 3-5 minutes. Add sweetener if desired.